I have been crocheting since I was 14, learned knitting, didn't like it then, but have since picked it back up just to know how. But my love is crocheting. I also enjoy quilting, sewing, and weaving. July 2016, I was pinned as CGOA Master Crocheter. Learning is so much fun and good for the ole brain. As of October 5, 2016, I am married to my high school sweetheart, we hadn't seen each other in 34 years. Crocheting, knitting, quilting, sewing, reading, camping. Did you figue this out? I have come to the exact same situation. Well I signed up for Kim Guzman's Drop Stitch Shawl class on here last year or the year before, I can't remember. I got going on it and was enjoying and life got in the way. I finally was able to pick it back up and got if finished. Absolutely love how it turned out. Several friends want it Thank you Kim for your wonderful class and instructions. My newest afghan - for ME !!! Beautiful! I would love to see a picture of the afghan that is peeking out from under this one....looks really nice from what I can see. Our annual Coastal Carolina Fair opened yesterday and I had entered the Ring Toss Afghan in it. The judges liked it; it got 1st place and 1st place Best of Show. So exciting!! 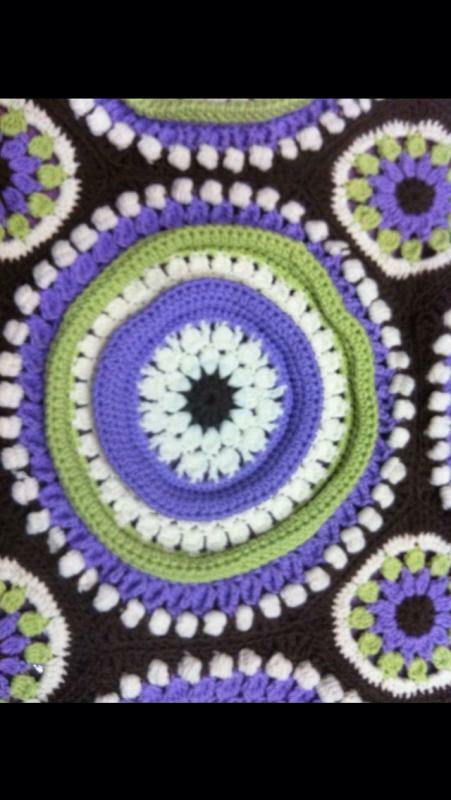 When I received the August 2012 issue of Crochet World, I was in love with the cover photo of the Ring Toss Afghan by Barbara Worn-Wurtz. I immediately went out and bought the yarn to start working on this fabulous 3-D afghan. It has a couple of stitches I had never done, and was so much fun learning. I absolutely love this pattern and can't wait to put it to good use this winter. I started it July 4th weekend (I think) and just finished the last border last night. So thrilled with it!! For purchase from Annie's Attic. I have frogged the whole thing for the third time. IT is going on the back burner for awhile, going to do a different afghan for awhile while I think on the other one. Can't see wasting that much time when I can be productive on something else in the meantime. I will get back to it one day, but too frustrated with it right now. Has anyone out here made the Six-Pointed Star Afghan, pattern from Annie's Attic? I have started this one over twice and have ripped out countless times. The center wants to bow up; and the join looks crazy to me. You turn at the end of each ripple row. Does anyone else have this problem or am I just ccrazy?? Hi, I made the same one and you are absolutely correct about that kit/pattern. It was so frustrating to make, but I did persevere and completed it. Although, I added one extra row on the border to make it a bit more ruffley. My picture is out here, too. Yours is beautiful! !